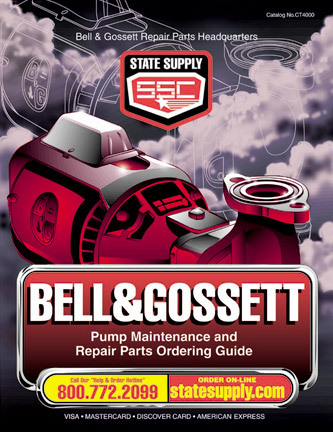 Bell & Gossett PT-5 is a 2 gallon diaphragm expansion tank for potable domestic water systems. The tank pipe connection is 3/4" male and is pre-charged to 40 psi. The tank dimensions are 8" diameter x 12-5/8" height. Maximum working pressure is 100 psi. Maximum temperature is 240 degrees F.
Bell & Gossett PT-12 is a 4.4 gallon diaphragm expansion tank for potable domestic water systems. The tank pipe connection is 3/4" male and is pre-charged to 40 psi. The tank dimensions are 11" diameter x 15" height. Maximum working pressure is 100 psi. Maximum temperature is 240 degrees F.
Bell & Gossett PT-25V is a 10.3 gallon diaphragm expansion tank for potable domestic water systems. The tank pipe connection is 1" male and is pre-charged to 40 psi. 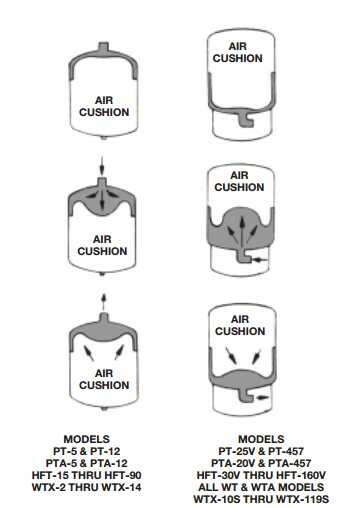 The tank dimensions are 15-3/8" diameter x 19-1/4" height.Maximum working pressure is 100 psi. Maximum temperature is 240 degrees F.
Bell & Gossett PT-30V is a 14 gallon diaphragm expansion tank for potable domestic water systems. The tank pipe connection is 1" male and is pre-charged to 40 psi. The tank dimensions are 15-3/8" diameter x 23-7/8" height. Maximum working pressure is 100 psi. Maximum temperature is 240 degrees F.
Bell & Gossett PT-42V is a 20 gallon diaphragm expansion tank for potable domestic water systems. The tank pipe connection is 1" female and is pre-charged to 40 psi. The tank dimensions are 15-3/8" diameter x 31-5/8" height. Maximum working pressure is 100 psi. Maximum temperature is 240 degrees F.
Bell & Gossett PT-60V is a 34 gallon diaphragm expansion tank for potable domestic water systems. The tank pipe connection is 1-1/4" female and is pre-charged to 40 psi. The tank dimensions are 22" diameter x 29-5/8" height. Maximum working pressure is 100 psi. Maximum temperature is 240 degrees F.
Bell & Gossett PT-80V is a 44 gallon diaphragm expansion tank for potable domestic water systems. The tank pipe connection is 1-1/4" female and is pre-charged to 40 psi. The tank dimensions are 22" diameter x 36" height. Maximum working pressure is 100 psi. Maximum temperature is 240 degrees F.
Bell & Gossett PT-180V is a 62 gallon diaphragm expansion tank for potable domestic water systems. The tank pipe connection is 1-1/4" female and is pre-charged to 40 psi. The tank dimensions are 22" diameter x 46-3/4" height. Maximum working pressure is 100 psi. Maximum temperature is 240 degrees F.
Bell & Gossett PT-210V is a 86 gallon diaphragm expansion tank for potable domestic water systems. The tank pipe connection is 1-1/4" female and is pre-charged to 40 psi. The tank dimensions are 26" diameter x 47-1/4" height. Maximum working pressure is 100 psi. Maximum temperature is 240 degrees F.